Golden Apples: Well-- I have been working on my socks! I know, it’s a knitting blog—and every once in a while, I go off knitting. Yesterday, I picked up the scarf, and admired it yesterday, but… that’s as far as I got. I am in a bit of rut. I generally like the cool weather—but the past ten days have been brutal. I love to knit hats, (and have dozens in my collection) but I don’t much like to wear hats. I don’t like things over my ears, or tight around my head. I don’t like scarves or things around my neck either. I can manage crew neck knit (commercial cotton) tops, but I hate turtle necks. Most of the time, NYC winters are mild enough, that I don’t feel the need for a winter coat. Layers (long sleeve cotton tops, or short sleeved ones, with vests, or long sleeved woven cotton shirts, and a light weight outer jacket is plenty – I usually fell warm. And I still end up feeling cold. Indoors (at both work and home!) have plenty of heat—but the wind drives drafts of cold air everywhere—All I want to do is crawl under the covers and get warm. Well the cold snap is coming to an end--by the Friday we should be back to the more seasonable low to mid 30’s—vs the high 20’s! And the wind is dying down. So, getting to knitting (the supposed topic of this blog!) --here are the newest sock—1 full color repeat completed—and about 6 inches. I’ll place the heel (and work it in a separate solid black) in the mostly black portion of the color pattern—(or about in another 2+/almost 3 inches!) --as you can see, (cast on) there are some rows of color, there are a few rows of black, and then a long bit of colors before a larger portion of more black. 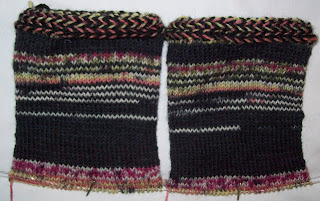 Putting the heel in the solid black portion of the stripe pattern will have the least distruption. I really dislike how the heel flaps and gussets mess up self striping patterns. This colorway makes it easy for me to sub a solid (black) and not have it be to noticeable! I am liking this! (Oh what fun—2 things just occurred—1 a space heater to counteract the drafts (at work) and the radio (QXR –a classic station that is part of NPR) just put on the William Tell overture (the theme from the Lone Ranger for some of us). It has been brutally cold. I'm completely and utterly fine with temperatures down to about 5 degrees, but as soon as the wind kicks in... bleh. The socks are looking great! I hope it warms up for you too!